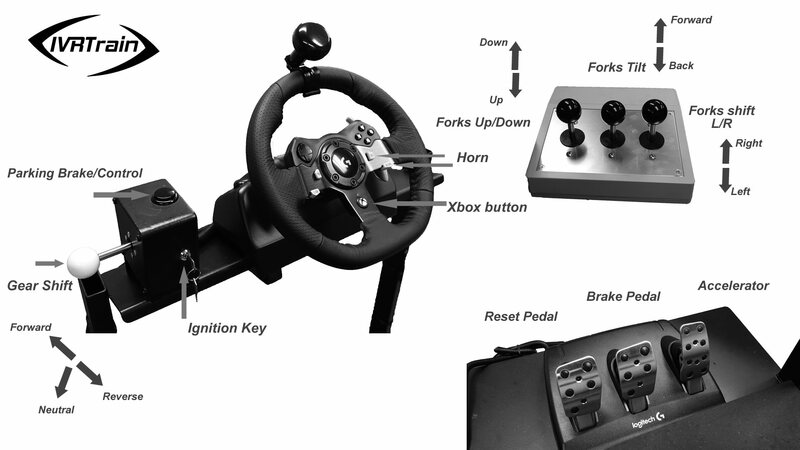 The fork lift simulator has been the most requested item across a wide range of industries. A fork lift is a dangerous and heavy vehicle capable of serious damage if not operated properly. Training employees on real equipment creates unnecessary risk for damage or injury and disrupts operations. The fork lift simulator in conjunction with class room training can provide a means to screen employees for aptitude before placing them on real equipment. It also provides a means to test and retrain employees to ensure all safety and operational procedures are being met. The simulator uses mixed reality with physical controls and virtual visual and audio environments. Drive through the semitransparent gates between the cones. Weave in and out of the cones going through gates which appear sequentially. Task is complete when all 12 gates have been crossed without hitting a cone or going in reverse. This simulation allows the user to experience maneuvering a rear wheel steering vehicle with an extremely sharp turning radius. Cone hit or shifting the gear into reverse will result in failure. Drive in reverse through the semitransparent gates between the cones. Weave in and out of the cones going through gates which appear sequentially. Task is complete when all 12 gates have been crossed without hitting a cone or going forward. This simulation allows the user to experience maneuvering a rear steering vehicle with extremely sharp turning radius while going backwards. Cone hit or shifting the gear into forward will result in failure. Pick up a skid and place it on the rack onto the red square. Repeat with second skid. Remove both skids and place them on the red squares on the floor. Task is complete when both squares turn green. Pick up skids one at a time and transfer them to the end of the aisle onto the red squares without hitting any of the cones. Task will be complete when all four skids are transferred and stacked. This simulation increases in difficulty by limiting the space available to 12 feet between the cone lines, which is normal spacing between racks. If any part of the forklift hits a cone it will result in failure. If the load is moved without the forks being tilted, it will trigger a warning. If the load is moved with the forks higher than 5 inches from the floor, it will trigger a warning. Pick up a skid and move it to the back of the trailer and place it on a red square. Repeat with second skid. Remove both skids one at a time and place them on the red squares outside of the trailer. When complete both squares will turn green. This simulation provides training in driving a forklift within the constraints of a trailer. If any part of the forklift hits the trailer it will result in failure. If the load is moved without the forks being tilted, it will trigger a warning. If the load is moved with the forks higher than 5 inches from the floor, it will trigger a warning. Pick up the skid from the warehouse and take it down the ramp and place it on the red square outside the warehouse. Repeat with second skid. Remove both skids one at a time and place them on the red squares in the warehouse. When complete both squares will turn green. This simulation provides training in driving a forklift on ramps with and without loads. If the forklift is driven with the load facing down (going forward down a ramp or going backwards up a ramp) it will trigger a failure. If the forklift is driven without a load with forks facing up (going forwards up a ramp or going backwards down a ramp) it will trigger a failure. If the load is moved without the forks being tilted, it will trigger a warning. If the load is moved with the forks higher than 5 inches from the floor, it will trigger a warning. Pick up a skid and go down the ramp outside and up the ramp to the boxcar. Place the skid on a red square in the boxcar. Repeat with second skid on the other side. Remove both skids one at a time and place them on the red squares in the warehouse. When complete both squares will turn green. This simulation provides training in loading and unloading a boxcar. It builds on the previous simulation on using ramps. If the forklift is driven with the load facing down (going forward down a ramp or going backwards up a ramp) it will trigger a failure. If the forklift is driven without a load with forks facing up (going forwards up a ramp or going backwards down a ramp) it will trigger a failure. If the load is moved without the forks being tilted, it will trigger a warning. If the load is moved with the forks higher than 5 inches from the floor, it will trigger a warning. If the forklift collides with any part of the boxcar it will trigger a failure. Travel down the ramp and up to the boxcar and pick up a skid. Transport the skid back to the warehouse and place it on the rack in the back. Avoid traffic, stop at all intersections and honk. Repeat with second skid. Remove both skids one at a time and transport them to the trailer. Place them on the red squares. When complete both squares will turn green. This is the final simulation and uses all the skills learned in the prior simulations as well as introduces pedestrian traffic. If the forklift does not stop and honk at every intersection it will trigger a failure. If the forklift collides with a pedestrian it will cause a failure. If the lift is driven with the load facing down (going forward down a ramp or going backwards up a ramp) it will trigger a failure. If the forklift is driven without a load with forks facing up (going forwards up a ramp or going backwards down a ramp) it will trigger a failure. If the load is moved without the forks being tilted, it will trigger a warning. If the load is moved with the forks higher than 5 inches from the floor, it will trigger a warning. If the forklift collides with any part of the boxcar or the trailer it will trigger a failure.